Having a “team-problem”? this might help. Absence of trust – an absence of trusts leads to an unwillingness to be vulnerable within the group, which in turn means team members may not be honest about their weakness. On a practical level if people cannot be honest about what they can, or can’t, do well, or even about their mistakes, they will be less inclined to ask for help, or guidance when they need it. Needless to say this can create problems. In real life this is difficult when working in a competitive environment where you always look to gain advantage from your opponent’s weaknesses. However, for the sake of the team, let’s put our competitive side away. You have to assume that the intentions of your team members are good and that they are there to help and not to judge; so, you can be open and trusting. A good exercise you could do to build trust is a “Personal history exercise” where team members answer short questions about themselves such as number of siblings, hometown, unique challenges of childhood, favourite hobbies, first job etc. The idea is to get team members to relate to one another on a personal human level. It usually helps if the leader starts and shows his weakness first as this encourages the team members to be more open about themselves. 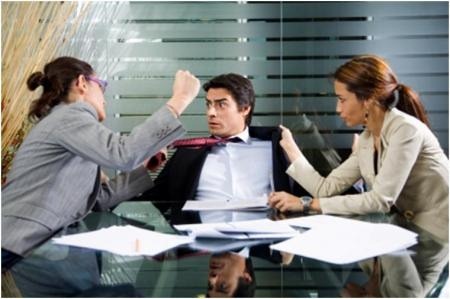 Fear of conflict – perhaps this is the most intriguing as one might think conflict is bad. Well, yes it can be if not done in a constructive way, however, if the conflict is about ideas and solutions rather than personal issues it can be constructive and avoid misunderstandings. Avoiding conflict for the sake of politeness, or because you don’t think arguing it is worth the effort can lead to problems. Following on from point 1, if people don’t trust each other they may be less inclined to disagree with one another and express their opinions openly. So, people may avoid discussing an issue in order to avoid conflict.. This can be a problem as it could lead to a situation where a number of people may think that what someone is suggesting is a bad idea but none of them say anything in order to avoid conflict, and as no one says anything they may all assume that everyone else is in agreement. As a leader you can stimulate healthy discussions by encouraging team members to speak up and rewarding them for their contribution. Lack of commitment – this can be a consequence of a fear of conflict. If your team don’t truly believe in their heart what the team “has decided” is the best course of action, even though nobody spoke out for the sake of avoiding conflict, they will certainly not buy-in to the resolution. As a result, they might not put as much effort into solving a problem as they don’t think the solution “chosen” by the group is the best approach. To overcome this you have to make sure all team members have bought-in to the solution (i.e. feel some ownership of it) and have agreed to a dead line to solve the problems and deliver the results. Avoidance of accountability – if there is lack of commitment; chances are your team members will avoid taking responsibility for their, or their peers’, poor performance. People can set low standards and underperform if they don’t really feel they own the problem and are accountable for delivery their part of the solution. To overcome this it helps if everyone has a clear idea of what needs to be achieved and by when. Another good idea is to incentivise and reward the team as a whole, rather than individually, as this way they will all feel obliged to perform to the best of their ability so as not to let the team down. Lack of attention to team results – in short, focusing on personal success, status and ego before or instead of team success. This can lead to people acting primarily for their own benefit rather than for the organisation, or working for the benefit their department rather than the success of the cross functional project they are working on. To solve this it is necessary to make sure the importance of team goals, rather than individual performance, is fully understood by all involved . Can you add anything else to the list? If so speak up!